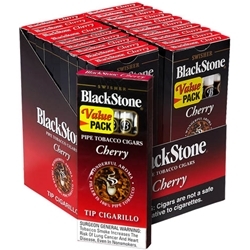 BlackStone Cherry Tip Cigarillo Cigars are made with an exclusive blend of pipe tobacco and offer satisfying and relaxing flavors with pleasant tastes of sweet cherry and classic tobacco with an intoxicating aroma. Packaged in handy packs of plastic-tipped cigars, perfect for those on the go. Try them here today at Smokers Discounts!